Quake is a first-person shooter PC game released in 1996. It was developed by id Software, the same company that created the Doom franchise. Today, there are plenty of ways to download Quake for free on the web. The easiest way to download Quake on a PC today is to purchase it on Steam. There are also several websites that host popular Quake ports and mods that you can play for free. Some ports and mods also require the original Quake game files in order to play. Best Old Games has the original DOS version, which will require a DOS emulator such as DOSBOX to play. QuakeOne.com includes a multiplayer component which uses the original shareware to enable multiplayer mode. DarkPlaces is a source port for Quake that features enhancements such as support for high-resolution, real-time shadows rendering, particle effects, and more. GLQuake is another source port of Quake built using the OpenGL graphics library developed by id Software. EzQuake is a multiplayer source port for Quake that is still updated. It features updated graphics, particle effects, and more. In Quake, players take on the role of a character simply known as the Ranger who has been given a quest to stop an enemy named Quake. Players teleport from present day back to a medieval setting where they must fight monsters and other creates using a variety of different weapons. Quake includes a single-player campaign and multiplayer game modes. The single-player story campaign contains more than thirty missions split across four episodes. These thirty levels include 26 standard levels and secret stages. There is also one final boss fight. 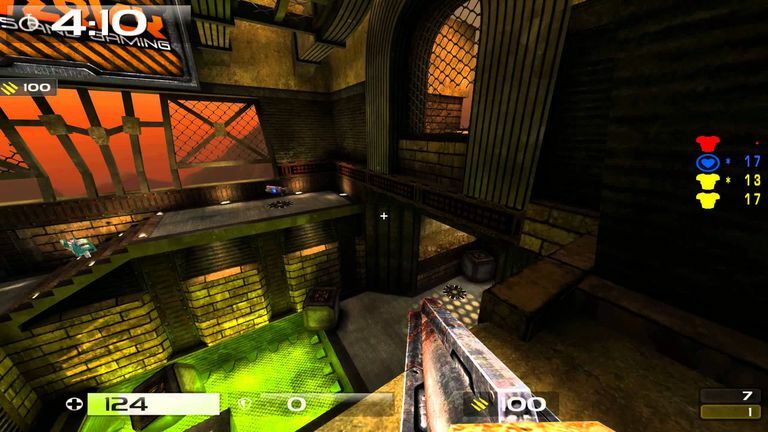 The multiplayer portion of Quake helped popularize multiplayer shooters and introduced a number of new games and gameplay techniques such as bunny hopping. The multiplayer component also includes the ability to play the single-player campaign cooperatively. The gameplay in Quake is similar to Doom, and the environments have a gothic look and feel. Quake is considered the successor to the Doom series because it was built with some of the same technology. One enhancement included in Quake over Doom is full 3D rendering of the graphics. Similar to Doom and Duke Nukem 3D, Quake has also been ported to a number of game systems including Mac OS, Linux, and a number of home console systems. The source code for Quake was also released, so a number of clones/ports have been created for the PC that are free to download and play. Nonetheless, the copyright to original and official Quake is still maintained, and the game is available for purchase via Steam for a very reasonable price. This makes the need to download the old DOS version or port somewhat unnecessary considering the game costs about the same as a cup of coffee.